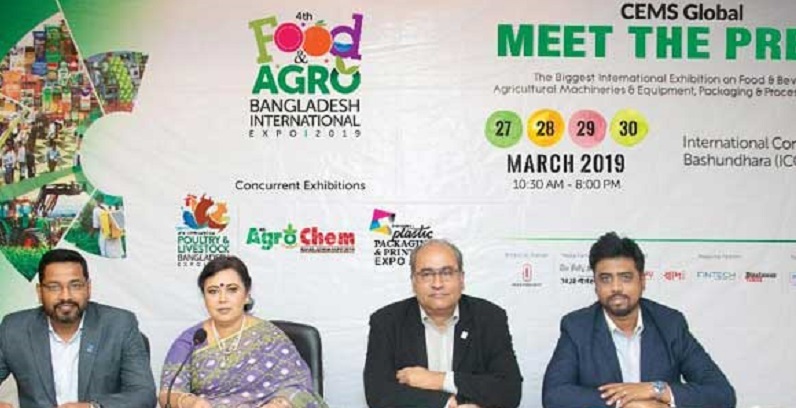 The fourth Food and Agro Bangladesh International Expo-2019 will begin on March 27 at International Convention city, Bashundhara (ICCB) in the capital. CEMS-Global is organizing the 4-day long expo. Meherun N Islam, president and group managing director of CEMS Bangladesh, announced the details about the expo at a press conference at the Economic Reporters’ Forum on Monday. “The expo will be a perfect platform for manufacturers and suppliers to showcase their products and services” she said. Among others, Tanveer Qamrul Islam, executive director of CEMS Bangladesh, Nayem Sharif, head of marketing and communications and Asif Arman were also present at the media briefing. The products from Bangladesh, India, China, Thailand, Germany, Italy, Japan, Malaysia, Vietnam, Palestine and the UAE will be showcased in the expo, Meherun said. Three more exhibitions will also take place at the same venue which are 4th Poultry & Livestock Bangladesh International Expo 2019; 4th Agro Chem Bangladesh Expo 2019; and International Printing and Packaging Expo 2019. The expo will remain open for all from 10:00am to 8:00pm till 30 March.